True coffee purists love the French Press and if you are a coffee lover and haven’t tried coffee from one you are missing out! I have long loved my coffee in the morning, in the afternoon and yes, even at super time. The last few years I have been really good about drinking more decaf but I will never give coffee up entirely, it taste too good. I first tried French press coffee actually in France eight years ago when I went to stay with some of our friends. I was blown away at the taste difference it made to my morning ‘cuppa’. Many people love the flavor it brings out of the coffee grounds but many also hate the clean up afterwards. It’s the number one gripe I hear about coffee presses. I know, I talk to people about their morning coffee – weirdo here. The Oxo French Press has a grounds keeper in it to resolve all those that have the hatred of the coffee grounds at the bottom. It easily pulls up using the lever at the side to clean. The Press comes a part easily for cleaning, drying and reusing time and time again. There is no scraping, banging it against the trash can for those pesky grounds at the bottom to let go. Rinse and put on your drying rack, it really is as easy as that. It’s so easy and quick to brew your coffee too. You just insert the silicone grounds ladle, add your choice of coarsely ground coffee then hot water. Let it sit for a few minutes and then place your Press in and push your grounds down to the bottom and pour the perfect cup of coffee. I love the idea of a French Press for my coffee because I can prepare more than one cup and have it at my side to keep topping up. Whether I am in full work mode at my desk, enjoying it in the morning over looking the garden, or have friends round for drinks and nibbles, it’s there hot & ready for me. It holds 8 cups so hosting afternoon tea for two or more it can handle it. Even better if you are like me and work from home I like to work in various places around my house. That being the case, I love getting a nice hot cup of coffee and a few nibbles on my lap tray and go work from the spare bedroom. My spare bedroom is the ONLY room that has an light in my house and on gloomier days I like to work from there so I don’t feel like I am sat in a cave working. The Oxo French Press was brilliant because I could brew a full pitcher of coffee and not have to run downstairs when I need a top up. 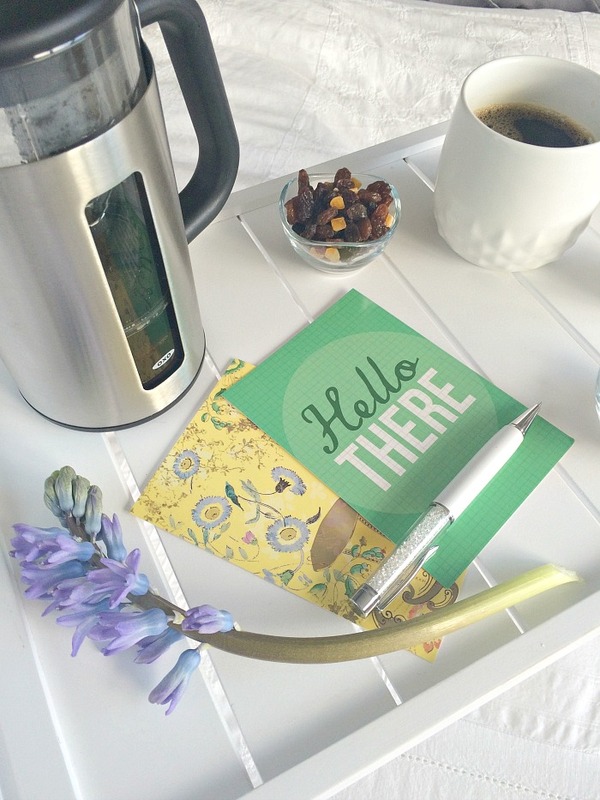 Or if I am writing postcards to family and friends back home I love to sit there and slowly sip my coffee and thinking of great, inspiring things to write to them about or even on my blog. I don’t know about you but I can’t think straight with cold coffee in my hand. 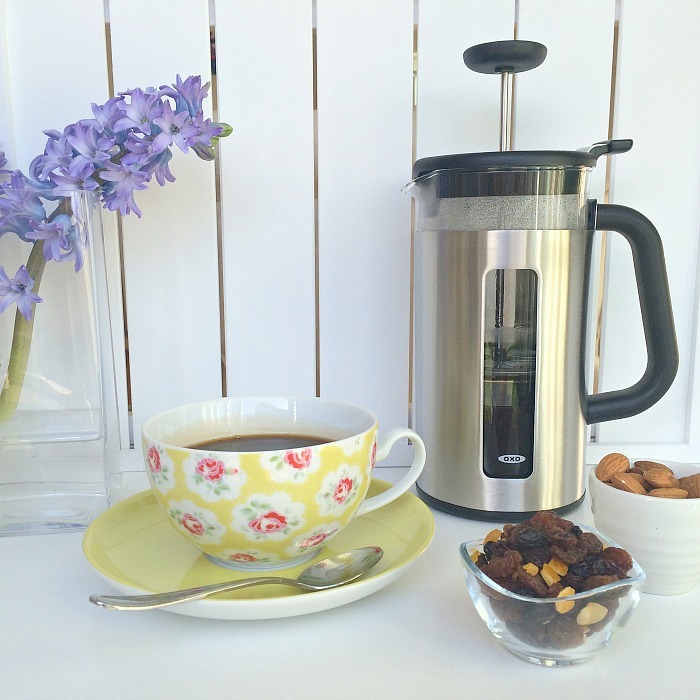 I was really impressed with the quality and user friendliness of the French Press. I also loved how easy it was to clean and store. Its definitely is great on working days from home to keep me going even if it’s just decaf within it. lol So now you know my secret working spots and how I keep myself topped up because I know you all really wanted to know. But don’t worry reading my review doesn’t go without reward…. see below! 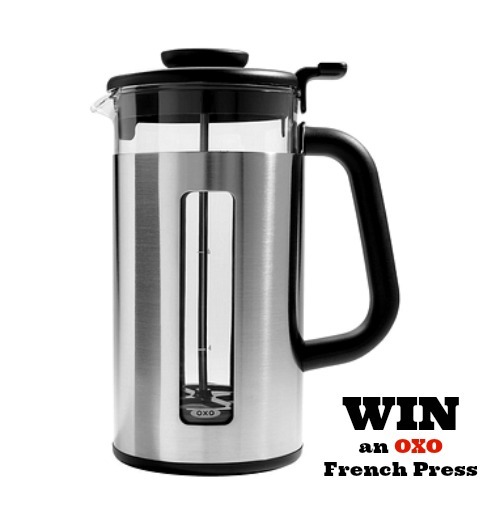 I am so excited to be able to offer you the chance to WIN your very own French Press with groundskeeper from Oxo. Get your entries in below! 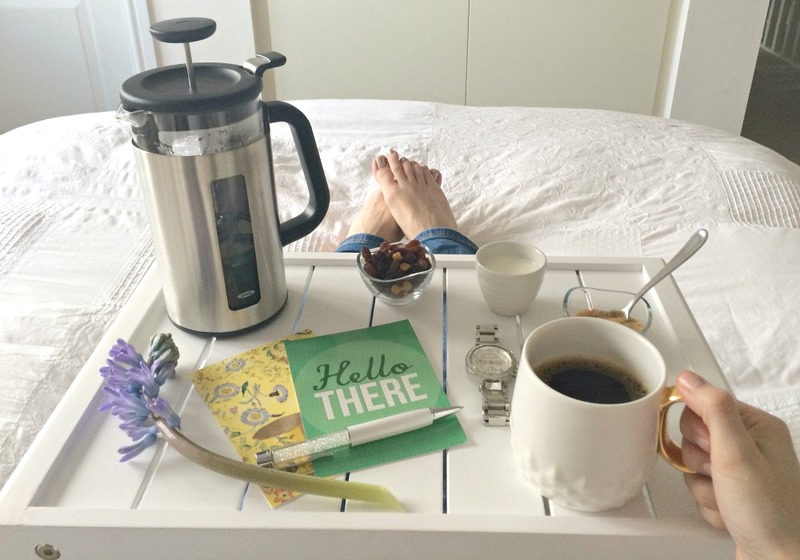 You could be sipping hot coffee from your bed soon, too! 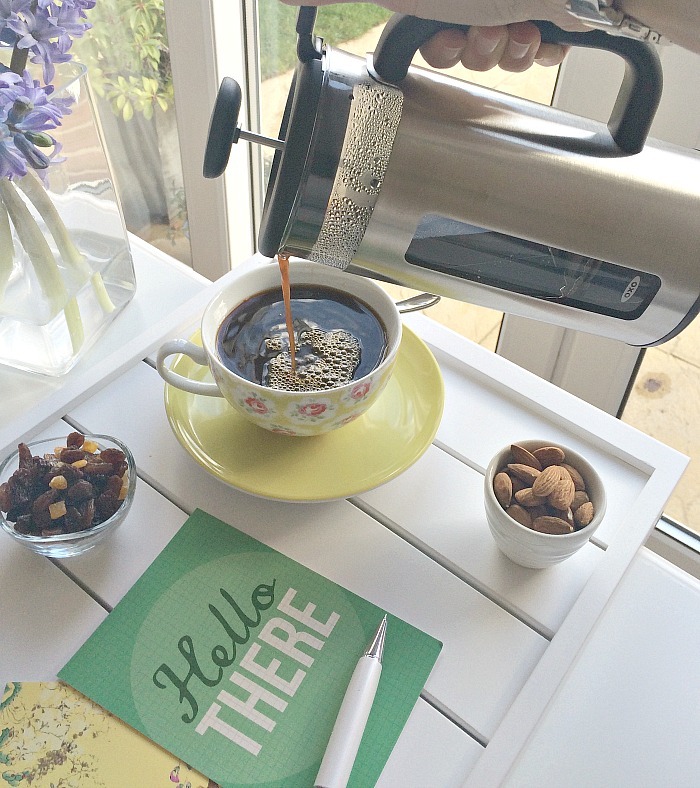 Great looking coffee pot. This would be ideal in our large family properties. Wow that looks great, I really struggle with the cafetiere type press, like you say it gets very messy and I can’t always stop grains coming into my cup! They are an amazing brand. I love all their stuff!! Thanks for hosting Kate. We love ours for sure. Good luck. Oh my goodness I need this! haha 😀 Crossing fingers. Oooh, I love this! Can I also add your photos are always so beautiful, I love your blog and don’t visit it enough…. I’m going to change that! I love the way you have styled your photos for this post.. so bright and clean! I definitely need one of these coffee presses in my life, as I really do hate having to try and get ours clean, so I’ve been using instant *cringe*.